I got this recipe off my friend Max, who is the most amazing cook. Max got this from NZ’s Healthy Food Guide (I’d hate to be hit up for not acknowledging the real source!). As usual I’ve adapted it a little (I can’t help myself…) and I reckon this is better than hummus. I have it on toast, on flatbreads, in sandwiches, I’ve even been known to serve it to accompany BBQ chicken kebabs. This is also a great dip to whip up if you’ve got friends coming over as it’s an ideal starter/entree. 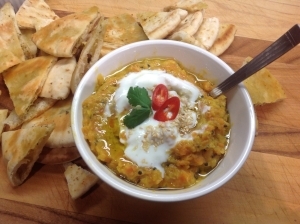 You just serve it up on a platter with bits of of toasted pita, crackers or raw veges. I made this for book club recently and I had several requests for the recipe, always a telltale sign I’m onto a winner! Lastly, this is low in fat, ticks all the boxes for the ‘good stuff’ and bonus – it’s simple and inexpensive to prepare. What’s not to like? Step 1: Heat oil in a medium sized saucepan, ideally one with a heavy base. Cook crushed garlic for 1 minute then add black mustard seeds, cumin seeds and cook until the mustard seeds start popping. Step 2: Add grated carrots to the saucepan and let carrots ‘sweat’ for about 10 minutes. Step 3: Add chicken stock, enough to just cover the carrots and add red lentils. Simmer over low heat for 30 minutes (Note – don’t put a lid on the pan!). Step 4: Add peanut butter, curry powder, salt and pepper (to taste). 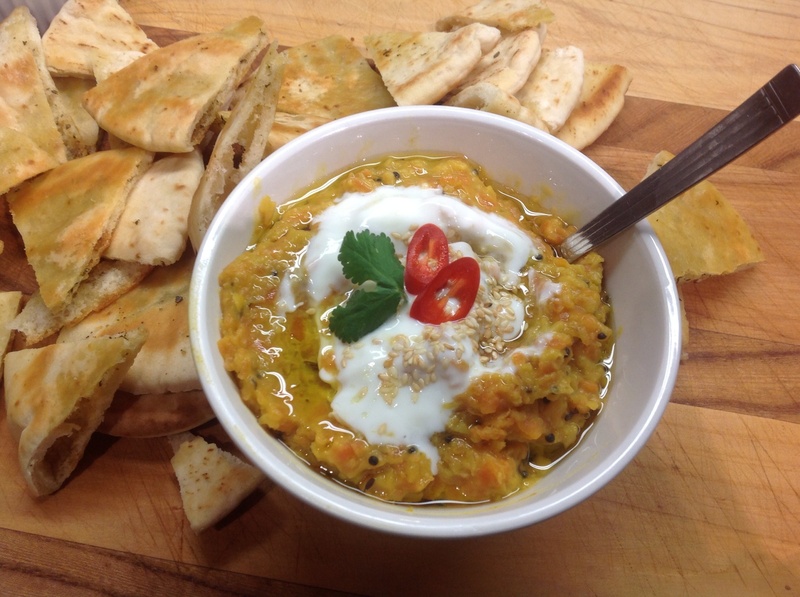 You want the dahl to reach a thick (hummus like) consistency. So, at this point, simmer it for a few minutes longer if needed. Keeps in the fridge, covered, for up to a week.